Scuzz Model: “In the Bank” or Gopher Meatballs? So here’s the good news after last weekend’s loss: The Cats season is not over. And most importantly, there was nothing in the course of that game that changed what we all believed about the Cats last Friday. The only worry I have is what sort of impact a loss like that can have on a team psychologically… I hope the players and coaches have been able to get back to normal this week, and have no lasting effects. Northwestern’s offensive rating didn’t drop too much as a result of last week’s game. The defense however, took a hit in the Scuzz model. This hardly seems fair given what we know about that game: the offensive production was predominantly driven by special teams; and the defense was really hurt by the lack of production on offense, and that last garbage time TD. 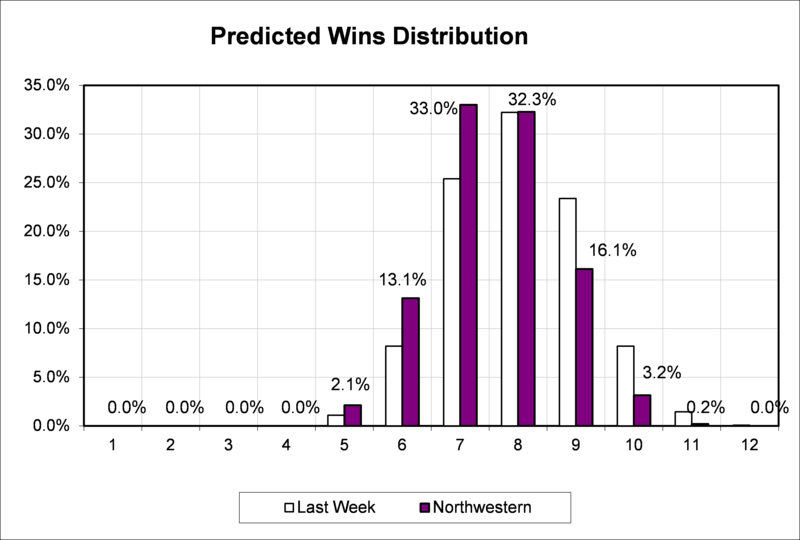 That said, the negative impact on NU’s expected winning percentage seems about right. As a result, the game by game projections have dropped for NU vs Michigan, Iowa, and Minnesota. The match-up with the Gophers this week presents a 50% toss-up. 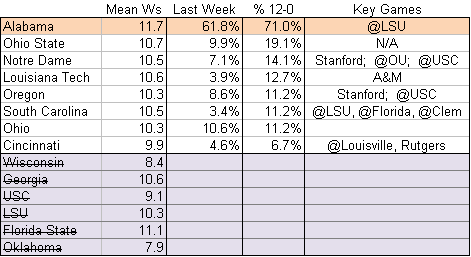 NU’s projection for the year still keys on 7 or 8 wins, while the possibilities at the high-end of the spectrum are way down. This is mostly because Michigan is looking real strong again, so to get to 10 wins the Cats would need to beat them, or sweep all of their other games. That said, a win against MN would shift very close to last week’s results. The Golden Gophers started out this year better than anticipated, but really fell flat two weeks ago against Iowa. Without Marquis Grey, the running game, passing game, and subsequently defense all suffered. 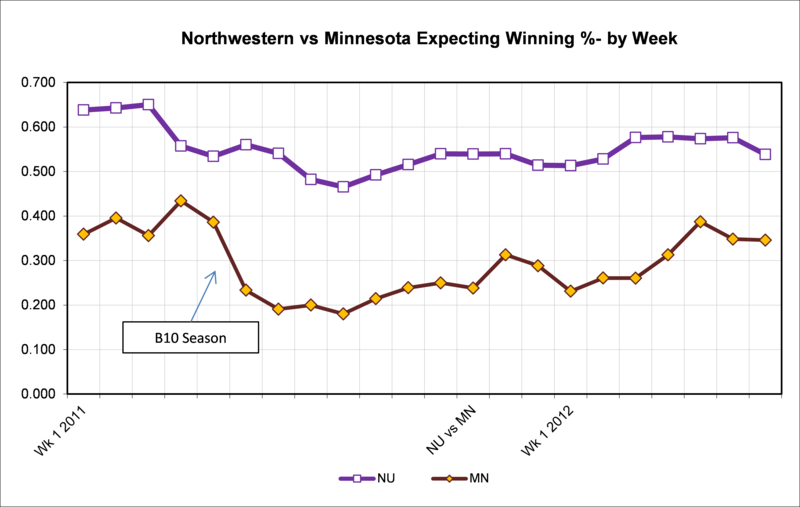 If we examine Minnesota’s expected winning percentage during the Jerry Kill era, we notice a similar trend from the beginning of the 2011 season… pretty good performance during the non-conference, and then a drop off come big ten season. MN never recovered after that drop in 2011… the last third of the season showed some promise (namely by beating Iowa), but the Gophers never really came close to even a 50% expected winning percentage. This year, the team had an even more noticeable rise in performance, particularly in weeks 3 and 4. The Iowa matchup has curtailed that slightly, but even without that loss, MN’s stats are not good. And unlike with Penn State last year, we don’t need any assumptions to create a gap in performance between NU and Minnesota. It doesn’t look like the QB Grey will be back 100% this week, which makes me feel pretty good about NU’s chances in this game. Grey with a tender ankle will be much easier to pressure and not nearly the same type of threat to run (he won’t quite be one-dimensional, but he won’t be as dynamic either). I certainly expect him and Max Shortell to put up some points on NU, but unlike the Penn State game, Minnesota can’t defend either one of the Northwestern offenses. That said, hopefully NU will be a bit more balanced this week and will really exploit the youth up front, and the holes in the middle of the Gopher D.
Oklahoma (-3) vs Texas: The model only favors Oklahoma in this matchup by 4, but I just think Texas has too many problems on defense. Also, unlike West Virginia, the Sooners are a bit tougher on that side of the ball. Iowa (+11.5) at Michigan State: The model is bearish on the Spartans this week. It still likes them to win at home, but only 3. Given MSU’s troubles with the pass, and the fact that Iowa has been able to run the ball effectively makes me think this should be a close game (not a blowout as Vegas has listed). Mississippi (-1) vs Auburn: Ole’ Miss looked alright against A&M last week, and now hosts probably the worst team in the SEC West. The line is only 1, but the model says Rebels by 5. Vanderbilt (+8.5) vs Florida: The Commodores are not good, but this looks like a pretty good trap / letdown game from the Gators. The model says Florida by only 8… that’s a pretty tight window to be picking on, but the intangibles look good for Vandy at home this week. Wisconsin (+1) at Purdue: Can the Badgers do it again this week? Purdue is much better than Illinois, and the Badgers have been awful on the road, but are the Badgers really going to lose this game? Purdue gave up 44 to Michigan, and 300 yards of rushing. Model has Wisconsin by 11. A great weekend of football has derailed three more would-be-challengers for the National Title game – FSU, LSU, and Georgia. The only real surprise is FSU, who lived up to their billing of the last 10 years by blowing a game they really should’ve won against an inferior opponent. Some are saying “Clemson-ing” could be re-coined “Nole-ing”. Can we just agree to say “ACC-ing”? Alabama remains the front-runner (though some are predicting a tougher-than-expected match up at Mizzou this weekend), followed now by Notre Dame. The Irish looked vintage on Saturday, dominant at the line of scrimmage, suffocating on defense (after the 1st couple Miami drives), and running the ball with authority. I think their remaining schedule is too tough (they’ve yet to play their 3 toughest opponents), probably leaving Oregon as your most likely challenger to Alabama. We’re getting close to the point of a single upset being able to cause major BCS chaos (wouldn’t that be ironic with a playoff game only two years away). Posted on October 12, 2012, in Saturday Morning Stats. Bookmark the permalink. Leave a comment.